Converted warehouses hold a special place in Melbourne and are some of the city’s most sought-after properties. Complete with sawtooth rooflines and exposed timber beams, the Oz Property project at 37-39 Shelley St, Richmond will include nine industrial-themed townhouses. Converted warehouses hold a special place in Melbourne’s inner suburbs and are some of the city’s most sought-after properties. Now a developer is creating townhouses to look like them from scratch. 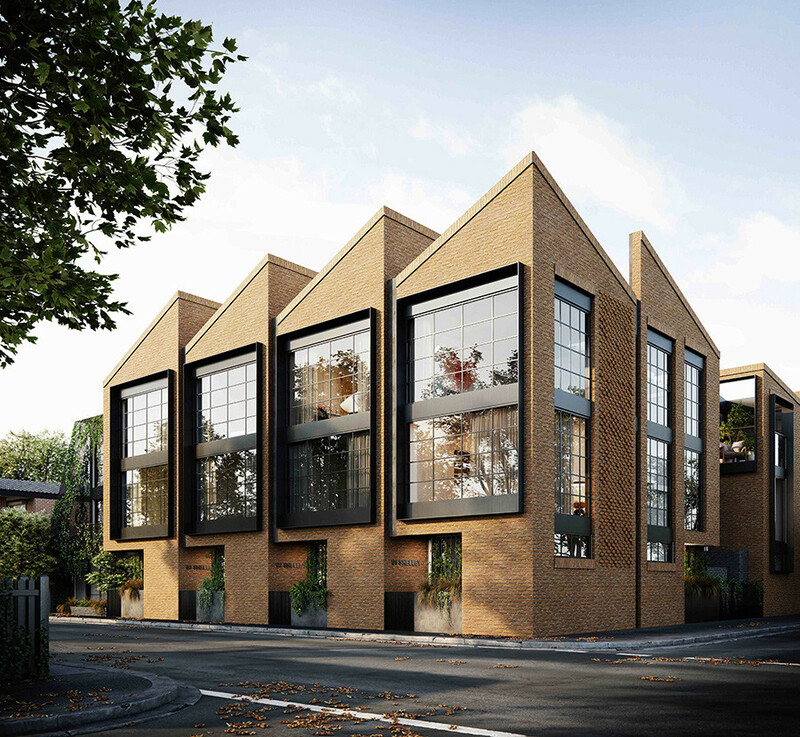 Complete with sawtooth rooflines and exposed timber beams, the Oz Property Group project at 37-39 Shelley St, Richmond will include nine industrial-themed townhouses. The DKO Architecture design replaces a former printers warehouse on a corner block with three street frontages. The townhouses feature unique industrial styling inside as well. An angular facade and industrial warehouse-style windows add street appeal, while triple-storey floorplans take advantage of clerestory windows to create light-filled interiors. Inside it will take industrial chic a step further, swapping out traditional kitchen and bathroom joinery for wire mesh screens. SLAB Architecture director Seada Linardi oversaw the interior design and said it wasn’t about mimicking a converted warehouse, it was about reimagining it. Clerestory windows are oriented to the southwest — the same way all warehouse windows were to make the best of soft light for workers. “It’s more paying tribute than mimicry,” Ms Linardi said. A shared central courtyard garden will act as a secondary access to the homes for owners, and some of the townhouses will also come with a rooftop terrace, while others have a more traditional terrace adjoining their living area. Few converted warehouses can offer a rooftop terrace. Each townhouse will have its own street frontage and pitched ceilings soaring almost 3.5m overhead. “We’ve added more height to create more light,” Ms Linardi said. Walnut timber floors and Caesarstone benchtops also feature alongside a “flexi room” facing the courtyard garden entry. Buyers can opt for custom joinery that allows them to add a fold-up bed and fold-up desk to the room or to turn it into a space more particular to their needs. Shops, cafes, green spaces along the Yarra River and schools are all within walking distance. The CBD is a short commute away via Victoria Pde trams or North Richmond train station. The townhouses are priced from $1.35-$1.5 million. An official launch is set for later this month, but sales agent Georgina Mellick said the project had already had a strong response on social media. A display suite will open in the existing printers workshop on site on Saturday, March 30. With every project, we start the same way, which is by looking at the context in which the project will sit: the site and history of the area. Our most recent project was Shelley St, Richmond by Oz Property. We started by spending time in the Richmond area to get an understanding of the lifestyle in the area. In her own words, SLAB‘s Seada Linardi describes her studio as a practice that is driven by an aesthetic approach to design. It’s young and youthful and she is “proud of the fresh thinking that the SLAB team demonstrates in each and every one of our projects.” Made up of a team of seven makes the boutique studio agile, allowing for a level of flexibility that can really focus on design. How do you approach your projects? Do you have a set process? With every project, we start the same way, which is by looking at the context in which the project will sit: the site and history of the area. Our most recent project was Shelley St, a townhouse project in Richmond by Oz Property. We started by spending time in the Richmond area to really get an understanding of the lifestyle in the area. We workshop questions like “How is the history of the area relevant to the site and project?” and “How do we make sure we respect the area and what is already there, through our design?” Then we implement all our findings throughout the design. 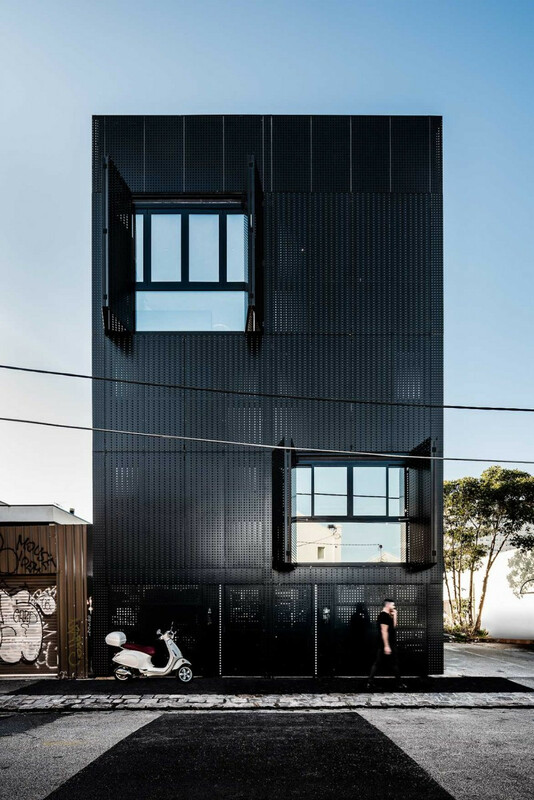 With Shelley St, for example, the design reflects the history of Richmond through aspects like the use of sawtooth roofs, brick façade and industrial aesthetic that Richmond is known for which extend into the interiors. You founded SLAB in 2015, what have been some of the biggest learnings you’ve had throughout this process? The biggest learning for me has been the business side of starting a practice: things like managing people and business cash flow. Design comes naturally to me; I’m not afraid of the design process. It’s the business management that was the learning curve. And we aren’t taught this side at university either, so you have to learn quickly. What are some of the insights you can share being a female founder in a traditionally male-dominated (at least at director level) industry? There’s some truth in the saying “fake it ‘til you make it”. Taking my own advice to be brave and confident and to not get intimidated by anyone! You collaborate with your husband, Jesse Linardi, can you talk about that process and what it’s like? We work together really well, and the process is a naturally easy one. We also have the same design aesthetic, which is probably how we come to work together and collaborate so often. For things like Shelley St, we spent a lot of time over weekends in Richmond preparing for that project and getting to know the area. Because we’re married, it meant we could do that sort of thing easily and it doesn’t feel like work. The challenge is that because we live together, the work never leaves us. Twin townhouses, a “hyper terrace” by DKO and SLAB was a collaborative project between Seada Linardi and her husband. Photo by Tom Blachford. Do you have any secret weapons of advice to share with young female architects starting out in the industry? Be brave! It can be intimidating working in a firm. My advice would be to ask for help if you don’t understand something. It’s OK to absorb people’s experience and knowledge. Be true to yourself – don’t get stuck in a role that isn’t pushing you professionally and artistically. The biggest challenge would be learning how to be a hustler. You have to constantly be hustling. Also, when starting SLAB, it was all the unknowns. There were so many known unknowns when you start a business that you have to adapt and respond to, often learning as you go. What are you most proud of throughout your career? I love that I am able to provide the SLAB team with opportunities to really own a project. This is something that’s not always available to young architects and designers in big firms, and I feel proud to be able to offer the opportunity to work on a project from start to finish. How do you balance being a businesswoman and a parent? Honestly, it’s really hard and really challenging. Everyone says that, but it’s certainly true. I have a one-year-old, Savanah, and you just have to make it work. She stays with my mother three days a week, and actually comes into the office with me two days a week, where she has become part of the SLAB team. Baby gates and all. I love working, it’s a big part of my identity, and so while parenting and working are hard, becoming a parent is by far my biggest achievement and ultimately I’m grateful that I’m able to have the opportunity to do both. Oz Property is looking to add to its growing medium-density portfolio with its latest development, the aptly named Shelley St, located on the corner of Shelley and Garfield Streets in Richmond. The DKO Architecture-designed development comprises nine three-storey townhouses sited around a communal landscaped courtyard garden. Through the use of brick and a saw tooth roof line, the development has been designed to pay homage to Richmond’s industrial past and the site’s former use as a warehouse. Established in 2007, Oz Property believe in delivering sustainable, considered developments around key activity zones for a rapidly evolving and growing Melbourne market. With a strategy of appointing Melbourne’s leading architects, builders and planners, Oz Property aims to consistently deliver high quality projects based on sound financial outcomes. Previous projects delivered by Oz Property around Melbourne include Panorama on Lakeside, Balaclava Residences, On the Park and Highwood. Urban.com.au sat down with Oz Property Director, Raghav Goel to discuss the company’s latest project, and get a bit of insight into the business’s approach to site acquisition and development. Urban.com.au: How do you approach site acquisition? Do you seek out sites based on whether you have already determined that you want to develop a townhouse or apartment development? Or do you let the site determine that? Raghav Goel: It’s very adapted. We have had preconceived notions before but you quickly realise that’s not the way to approach it. We tend to focus on where we can add value. Any site that has an existing permit is much harder for us to add value to because it has already had a lot of work done so we try to focus on sites off market and ones that don’t have a scheme in place already. We love medium-density development and it’s something that we’re keen on continuing to develop. For us there’s no set formulas in site acquisition. U: And to follow up on that, you develop properties all over Melbourne, there’s no particular region or suburb that you’re fixated with. RG: And that’s what excites us – that challenge of doing something new, something different each time. We have a very strong relationship with our consultants and that’s something we tend to carry forward. It’s amazing how the same architect and consultant team can come up with a completely different scheme for a different location. U: You’ve previously worked with DKO and SLAB on The Workshop in Collingwood and this has carried through to Shelley St.
RG: We’ve got that relationship working with DKO going back almost ten years now, and Shelley St is probably our sixth project working with them. They also did Highwood with us and we also worked with them on Ascot Vale Road before Caydon purchased the site. That’s a relationship we’ve maintained and as our businesses grow the whole approach tends to evolve, which is exciting isn’t it? U: One thing DKO do very well is design a project within its context. Looking at the design response to a project in Collingwood compared to say Ringwood or Richmond, it’s evident the context is considered. At Shelley St this association with the context comes through in the saw tooth profile and brick exterior, which draws on the industrial nature of its locale. RG: (DKO) have been fantastic and SLAB as well, in how they do things and it really is a true collaboration in every sense of the word. In the beginning you tend to sit around a table – much like we’re doing right now – and just come up with ideas. We provide our architects and consultants with really simple briefs at the beginning of a project, and with the brief for Shelley St one of the critical aspects was we really wanted to provide independent street access to each townhouse and we wanted something standalone so that it almost feels like a terrace but with a contemporary and environmentally sustainable approach… natural daylight, ventilation etc. How we ended up with the saw tooth (roofs) how we ended up with the brick (exterior) that came from the architect’s expression of how they saw the site. And the project feels like it just belongs in Richmond, doesn’t it? We’re quite pleased with the design and looking forward to seeing it realised. U: With these more urban townhouse typologies we’re seeing them developed almost as a hybrid – they’re an ensemble of individual townhouses which collectively form a cohesive composition but appear more like an apartment building. RG: I’d say it’s probably about the balance of medium-density development. Definitely these have individual street access and frontages but the architectural form and expression is a ‘whole’ and that’s how they read together on the streetscape. That’s just as critical because if you were doing a standalone house, with a saw tooth form, all brick with such large windows, its probably going to stand out. Something like this on a corner site, in an urban location you get the added benefits of a communal courtyard space through the middle which provides a sense of security and a sense of community for people who want it. It’s interesting how some people don’t like the idea of neighbours, so (Shelley St) gives you the option of engaging with your neighbours if you want, but also retreating back into the privacy of your own home if that’s what you prefer. An apartment building with a shared and enclosed corridor will never provide you with that, and townhouses tend to allow for that more commonly, which is good because it appeals to a slightly different market – the owner-occupier – who have been there and done that, and now realise what they want. U: What buyer type would you see buying into Shelley St? RG: If you look at say, The Workshop in Collingwood – which again DKO and SLAB designed for us – it’s interesting because we thought the demographic there was going to be young professionals, potentially 30-somethings looking at their second or third home because those were loft-style apartments… split level of about 70-80 square metres. In the end we actually saw a whole lot of 20-somethings who were really excited to get into the market and saw that they could either live in it or have it as an investment property as well. Coming back to (Shelley St) we aren’t ruling that out although we think it will probably be suited more towards 30-somethings, potentially with kids or with kids on the way. But you know, you tend to see instances where they get support from mum and dad so you can’t rule anything out. U: You mentioned the development has a central courtyard. Does that mean the townhouses have a dual aspect or in the case of the corner a triple aspect? RG: There’s actually three streets, so there’s obviously Shelley and Garfield but then there’s also a laneway along the rear off Shelley Street, which provides individual access to the four townhouses at the back and then the five along Garfield although the fifth is a bit hidden. That was critical because we wanted to maintain that streetscape, and there’s an existing building adjacent to the site so we wanted to drop down in scale with the townhouse on the end. It’s similar to what we did at Balaclava (Residences) as well. Interestingly when you walk down the street, it’s almost as if the building has always been there but it’s brand new, it sits comfortably in the streetscape. That’s what excites us about medium density – it’s not something bold and brash that changes the dynamic of the streetscape. As you walk you subconsciously realise there’s something pleasant on the street. I think that’s the direction Melbourne is going in and the type of streetscapes we’re likely to see across the city in the future – well designed medium-density. Don’t get me wrong, we can all appreciate Melbourne’s skyline and its striking buildings but I think it’s critical for our inner-suburbs to evolve architecturally. license. Read the original article. With a population of 17,471* and rising, a range of factors have contributed to Ringwood becoming a key property hot spot with investment from both the private and public sectors. The major catalysts has been the $66 million redevelopment of Ringwood Station and the $665 million expansion of Eastland Shopping Centre, which also included a Sage Hotel – the first to be developed above a shopping centre in Melbourne. A RINGWOOD off-the-plan townhouse has made its buyers a profit of more than $150,000 in just five months. The townhouse’s capital appreciation of 27 per cent is the highest recorded for the suburb, an area that has been dubbed a burgeoning satellite city. Investors Lu Dongyan and Duan Hongbo purchased the yet-to-be-built property at 22/37 William Stfor $549,000 in 2015. A few months after settlement, in November 2017, they sold the three-bedroom pad within the Highwood development for $702,500. The property was listed via Jellis Craig Doncaster and had initial price hopes of $620,000-$670,000. Oz Property developer Raghav Goel said it was becoming more common for people to make money from off-the-plan apartments quickly, but some areas had done better than others, Ringwood a prime example. “There has been a lot of investment made from the government and money being spent helps any property in Ringwood,” Mr Goel said. Only two of the 36 properties were purchased by investors, the remaining were bought by owner occupiers. The suburb has been identified as a designated development area by the state government, earmarked as a key property hotspot for Melbourne. It has experienced 73.6 per cent growth in the last five years, landing it with a $874,000 median house price, CoreLogic data shows. The master plan enclave consists of 36 spacious townhouses across a 1.3ha site, a property owned by a local vendor for more than 50 years. “We always had a vision to create a strong community and were conscious of the fact that is a large parcel of land and there are neighbours on all four side,” Mr Goel said. Mr Goel said despite the risks involved in buying off the plan there is plenty of money to be made. “It’s always tricky buying off the plan and research is critical,” he said. “The research should be about who the developer is, the design team and architect. The scaffolds have (mostly) come down at Balaclava and finishing touches have begun. The blackbutt cladding has been given a coat of natural protective seal which should silver off beautifully!